You saw the picture. Maybe you watched the video too. Or maybe you avoided paying attention because the sight was too violent? Here is the picture. 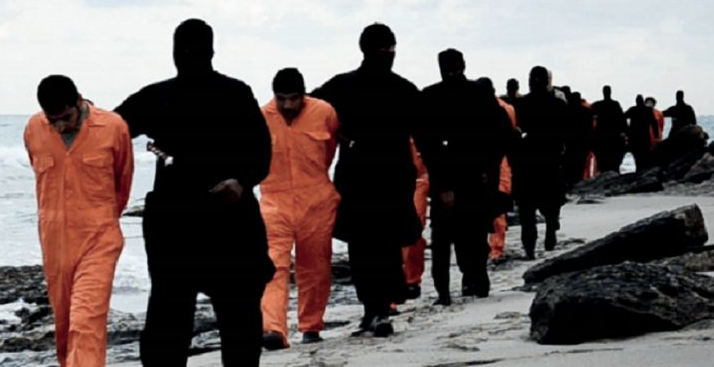 A group of Coptic Christians from Egypt, dressed in the orange prisoner costumes are led ritualistically to slaughter somewhere on the Mediterranean shore in Libya. They are then lined up and forced on their knees next to each other. Behind them are standing, posing arrogantly and shamelessly, their assassins with their knives at the ready. Anticipating the imminence of their death the victims are praying, “Ya Rabbi Yasua” – “My Lord Jesus”. The next moment the innocent men are dead, beheaded. Their only crime was that they were “the people of the cross”. The picture is designed to provoke and intimidate. 21 Coptic Christians were slaughtered ritualistically in a cold, demonically staged blood sacrifice. The message intended for the rest of the world is brazenly clear – ‘Cristians across the sea you are the next, we are coming after you’. It is a picture so gruesome that many dare not look at it because it renders one utterly helpless. When you see it, or watch the video, you know that there is no chance that God would have anything to do with it, and that Christ was crucified again in the beheading of the 21 innocent men at the hands of the wicked men. 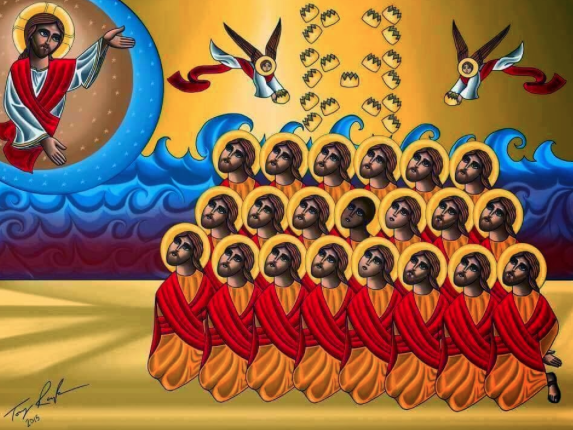 Tony Rezk’s icon representing 21 Coptic Christians beheaded in Libya. We have to ask: Where is the outrage of the world leaders now at this unspeakable atrocity? Where are the promises of decisive action? Where are the protests of the millions in the world capitals now in solidarity with the families of the victims? Where is a public display of the worldwide encouragement for the Egyptian Coptic Church now? Where are the slogans that claim “We are Copts”, as the statement that we will stand for the freedom of religion for all, whether they are Christians, Jews or Muslims? If the attack on the lives of French cartoonists two weeks ago, who over the years insulted everyone and anyone with their distasteful cartoons, was an attack on the freedom of speech, then this despicable act of terror against Coptic Christians was a direct attack on the freedom of religion. 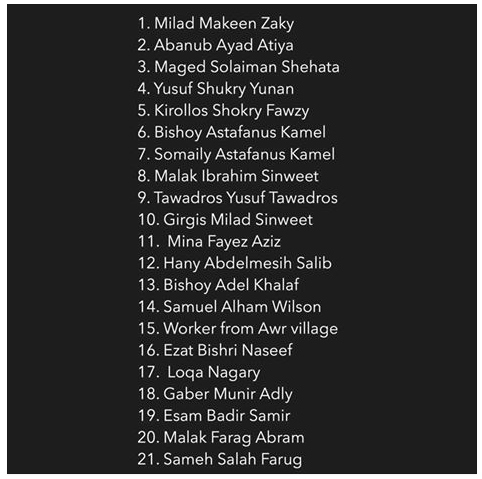 21 innocent men, who did not insult anyone, were murdered only because they believed differently from their assassins. Let us remember that freedom of religion and freedom of speech are closely related. One is included in the other. Wherever the freedom of religion is absent, freedom of speech is taken away too. Without freedom of religion one’s respect for human dignity does not exist either. In fact the lack of freedom of religion is always an indicator that all other legitimate human rights are suffering too. And the ISIS and its allies have proven repeatedly and graphically in the past months that they despise all freedoms, of which they hate the freedom of belief the most. Unfortunately, it seems that the appreciation for the freedom of religion is getting out of fashion today in Europe and US too. If the graphically featured cruelty in the latest video produced by ISIS affiliates is not able to shock the governments and the peoples of the world, what else is needed to wake us up out of our lethargy? What happened to our values if the terrorist attack on the group of caricaturists, who systematically mocked all worldviews, could instantly get millions on their feet in an act of defiance against the threat to free speech, and yet the most recent brutally ritualistic and graphically choreographed bloody attack on the freedom of belief is able to cause the outrage of only a few across the world, and only a superficial coverage in the mainstream media? Sadly, many of us still act as if caring about the persecuted in some far away country causes us too much inconvenience. We would prefer not to be disturbed. It seems that preserving our lifestyle of indulgence, which we call “our values”, is more important than the suffering of people out there. We are satisfied with the short, fast pacing and shallow snippets of “breaking news” that would initiate an occasional sigh or casual condemnation; only to rush the next moment to our favorite TV show filled with graphic scenes of violence and messages of fake justice produced by Hollywood or alike. We are more concerned about what is going to happen in the next episode of NCIS, CSI, The Hunger Games, or any other popular TV show than about the suffering of millions of people in another country? We talk with more passion about the latest results of our favorite football game than about the needs of people whose lives are being systematically dehumanized. At the same time, while we are well entertained, our brothers and sisters around the world are dying daily – beheaded, burned alive, crucified and killed in many other ways. When are we going to become outraged enough to pay attention? This entry was posted in Crime, Current Issues, Faith and tagged 21 Coptic Christians, Beheading, Copts, Crime, Cross, Deception, Egypt, evil, Freedom of Religion, Freedom of Speech, Genocide, Human dignity, Human Rights, Libya, My Lord Jesus, North Africa, Persecution, Terrorism, The face of evil. Bookmark the permalink.